The tourist visa allows you to enter Bolivia simply to travel within the country for your enjoyment for a specified period of time. The tourist visa is one of the most difficult to provide information on because Bolivia does not require a tourist visa of citizens from every country. Bolivia's immigration law is based on the concept of reciprocity which basically means that whatever your country requires of Bolivian citizens, Bolivia will require of you. It is important, therefore, that you monitor the website of the Bolivian Immigration Service (known in Bolivia as Migración) for the latest information regarding visas for your country. Bolivia has created 3 lists of countries with different rules for visas. Citizens of the countries listed in Group 1 do not need a tourist visa to enter Bolivia. Citizens of the countries listed in Group 2 do need a tourist visa, but do not have to obtain it prior to travel. It will be issued to you as you arrive, either as you are crossing over a border point or when you arrive at the airport. Citizens of the countries listed in Group 3 are required to obtain a tourist visa from a Bolivian consulate prior to traveling to Bolivia and must show it to officials upon arrival. Visit the Bolivian Government's Immigration Website, and click on About the Institution at the top of the page, then click on Entry Visa for Tourism on the right side of the page. Find your country's flag or click on Others to see the requirements for your country. Per Bolivian law, as a tourist you may visit Bolivia for no more than 90 days per calendar year (each 365-day period). This maximum 90-day period applies to all tourists, even if you are not required to have a tourist visa to enter Bolivia. If you hope to remain in Bolivia for longer than 90 days, you are no longer considered a tourist and must choose a different type of visa, based on the specific purpose of your visit, such as a volunteer visa, student visa, or specific purpose (residency) visa. With a few exceptions and generally speaking, if you purchase your tourist visa at a Bolivian consulate in your country before arriving, the consulate will give you a 90-day visa. However, if you arrive in Bolivia without a visa and plan to request your tourist visa at the airport upon arrival, Bolivian authorities will initially issue tourists a visa for only 30 days. The process to apply for a tourist visa upon arrival at the airport is outlined here. If you later decide you'd like to stay longer than 30 days in Bolivia, you can renew your visa up to 2 times and up to the 90-day maximum allowed you per calendar year, simply by visiting a local Immigration office. The process to extend your tourist visa past 30 days is outlined here. You must visit a local Immigration office a few days before your visa expiration date to renew it for another 30 days. You will pay for each 30-day renewal. How much you pay will depend on the agreements Bolivia has in place with your country. Because of this, there is no single, universal price for the Bolivia tourist visa. For example, citizens of the United States (including Puerto Rico), are required to apply for a tourist visa at a Bolivian consulate in the U.S. prior to travel. However, due to the bilateral agreement Bolivia has with the United States, Americans are usually issued a 5-year visa (and sometimes even a 10-year visa). This allows you to visit Bolivia for a maximum of 90 days per calendar year for 5 consecutive years (or 10 consecutive years). In other words, you do not have to apply for a tourist visa each year. This is why tourist visas for U.S. citizens are so much more expensive than others. Because rules vary for different countries due to the concept of reciprocity, the information on this page should be used only as a general guideline. What if I didn't know I needed a tourist visa? If you can prove that you fulfill all the requirements to obtain the tourist visa you may be issued a tourist visa upon arrival. How long can I stay in Bolivia on a tourist visa? For however long your visa allows (if you've been issued a 30-day visa, then 30 days) but no more than 90 days per calendar year. No tourist from any country may stay in Bolivia longer than 90 days per calendar year. This is strictly enforced. How long can I stay in Bolivia if I don't need a visa? Even if no tourist visa is required of citizens from your country, the 90-day per calendar year rule applies to all tourists. Your entry date will be stamped in your passport upon arrival. Why is my visa for only 30 days, not 90 like other tourists? If you obtain your tourist visa upon arrival, immigration officials at borders and airports will stamp your passport for 30 days. If you plan to stay longer you may also extend your 30-day tourist visa up to 2 times for another 30 days each time, at the Bolivian Immigration Service office in major cities. 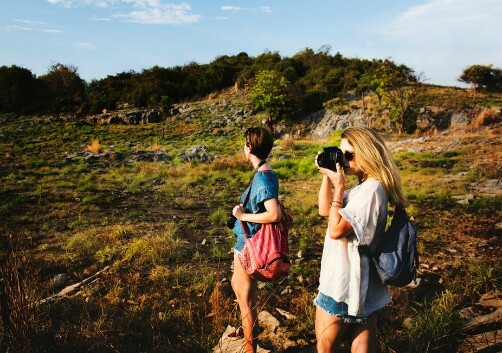 What if I overstay my 90-day tourist visa? Tourists from all three groups (including those who don't need a visa) will be fined Bs. 20 per day if they stay in Bolivia past the 90 days allowed per calendar year. Be prepared as you'll have to pay this in cash as you're leaving the country. (Also, be forewarned that while it may seem like a good idea to simply overstay your visa and pay the fine on your way home, it was meant as a punitive fine, not as a way to "extend" your visa. During the days that you are overstaying your visa, you are technically in the country illegally and exposing yourself to unnecessary risk as you will be subject to all Bolivian laws regarding illegal aliens and deportation). If I was given a 30-day stamp and overstay it, will I be fined? If you need more than 30 days, you must request (and pay for) an extension at a local Immigration office. If you do not do so before your 30-day visa expires, you will be fined. How many times per year can I enter Bolivia? Tourists may enter Bolivia up to three times per calendar year as long as they do not remain in Bolivia more than a total of 90 days per calendar year. For visa purposes, what is meant by "calendar year"? The 365-day calendar validity period for your tourist visa will begin on the date of your arrival in Bolivia, not the date on which the visa was issued to you at a Bolivian consulate overseas (for those of you who are required to obtain one prior to arrival) and will end 365 days later. For example, if you are issued a visa on June 15th of this year, it will expire on June 14th of next year. What if I don't enter Bolivia from my own country? In all cases, immigration law applies to your passport country (the country of your citizenship or nationality). This means that even if you are entering Bolivia from another country, the Bolivia visa requirements that apply to you are those of your country of citizenship. What if there is no Bolivian consulate in my country? We spoke with officials at the Cancillería in Santa Cruz, Bolivia and were told that if there is no Bolivian consulate in your country, you are free to obtain your visa from a consulate in a country near to you. Some Bolivian consulates are assigned to a specific region, and not just one country. Click here for a list of Bolivian Consulates and embassies in English-speaking countries. For Bolivian embassies and consulates in other countries, please refer to websites such as embassy-finder.com, embassy-worldwide.com, embassyworld.org, and others. Search for Bolivian consulates first. Most countries station an embassy and a consulate in foreign countries. Consulates (not embassies) do the work of issuing visas. Embassies will only issue visas if there is no attached consulate. Can I work in Bolivia on a tourist visa? No. 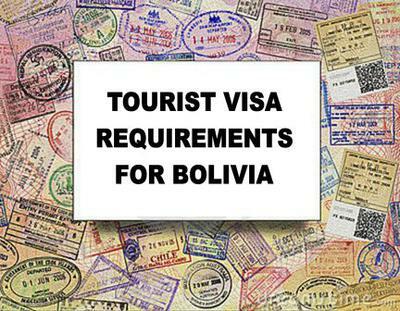 You cannot legally work in Bolivia if you enter with a tourist visa. You may do volunteer work, but if you are paid any amount of money for work done while traveling on a tourist visa, you are breaking the law. If I have dual citizenship do I need a tourist visa? If you are part Bolivian and have dual citizenship, you will have to choose which nationality you will declare as you enter Bolivia. If you wish to enter as a Bolivian, you must travel with a valid Bolivian passport and "carnet de identidad" (Bolivian identification card) ensuring neither of them has expired. As a Bolivian, you do not need a tourist visa to enter the country. If you choose to declare your other nationality, you must travel with the passport of that country and the tourist visa rules that will apply to you will be those that apply to your other nationality. If I enter on a tourist visa can I apply for residency? The answer to this question was "no" until just recently. Today, the Bolivian Immigration Service is making an exception to this rule for some foreigners, but not all. Each case is now reviewed on an individual basis. IF Migración officials determine they will make an exception for you, they will charge you a hefty fine to void your tourist visa and issue you a "specific purpose visa" (the visa you should have used to enter Bolivia if your plan was to apply for residency). The specific purpose visa costs US$85.00 per person when you apply for it before traveling to Bolivia. The fine to issue you one in Bolivia, and void your tourist visa, is roughly US$365.00 per person. If you have further questions regarding the tourist visa, you may post them in our Bolivia Visa Forum. This is a public forum. Other members of the public may or may not respond to your questions. You may also want to consider making use of our Question and Answer Service.